Hi loves! Today I bring you another beautiful polish by the lovely Sanaz at 365 Days Of Color called Bora Bora from her Travel The World Collection! PS. Please ignore my weird acrylic nails. My real nails started peeling when I got to Louisiana last week and it's been a downhill battle since. So sad, but hey, work with what ya got! Bora Bora is a smooth turquoise with a subtle baby pink shimmer. Sanaz named it Bora Bora after the place she's been dying to visit since she was younger. Girl, if you ever end up going, take me with you! How gorgeous is this? It really is the most perfect soft turquoise. Hell, it even made my pale skin look tan which is a huge win in my book! Application was a bit sticky, but overall had no big problems with it. Two-three coats did the trick. Close-up to see the gorgeous pink shimmer in it! I'll be the first to admit I thought it would be a RBL Aqua Lily dupe but it's not. Bora Bora is like Aqua Lily's super lighter cousin. L-R: Bora Bora, Aqua Lily, Bora Bora. Where To Buy: 365 Days Of Polish @ BigCartel - Travel The World Collection comes out on June 27th! 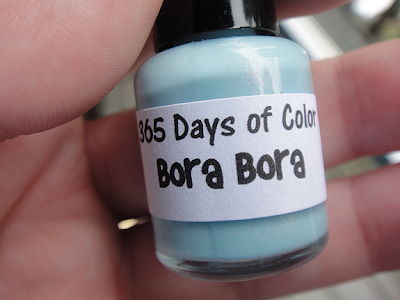 Check out 365 Days Of Color @ FB for updates and more swatches of the rest of the collection! Very pretty! How does it compare to Sinful Color's Cinderella? That's what I immediately thought of :) It appears a bit darker in the pictures. 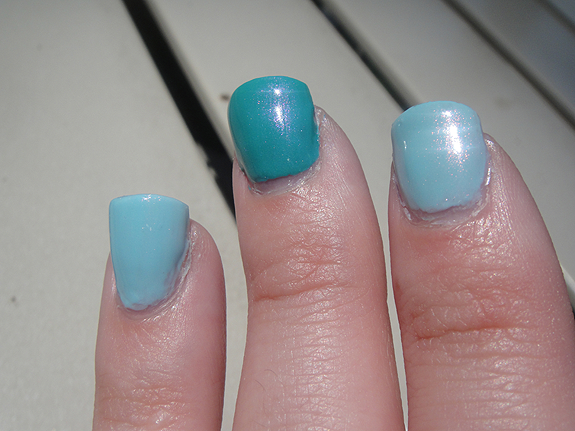 I have heard of an Aqua Lily dupe... Sation Oh My Oceania is a pretty close one (not identical, but very similar). That's a really good question! I'm going to take a comparison picture now! I totally see that now. Oooh, I'll have to check that out!